Being aware of and taking into account the differences between men and women in the world of work, from the right to a job with rights, to the material conditions in the performance of the most diverse functions, or to issues that relate to parenting, is a way of combating discrimination. In the last decades, despite all the progress made in this area, especially in the access to parenting with rights, or in the improvement of the physical/material conditions for the performance of each employee’s functions, the fact is that gender discrimination continues to exist and is a breach of the Constitution of the Portuguese Republic. There is still much to be done to improve the working conditions offered to women, taking into account their biological or other specificities. In this month’s article, we would like to share with you some information that is important for you to know, provided by the EU-OSHA (European Agency for Health and Safety at Work). It’s the European Union’s information agency for occupational health and safety matters. It contributes to the EU’s 2014-2020 Strategic Framework on Health and Safety at Work and other relevant programs and strategies such as Europe 2020. Every single person is responsible for Health and Safety at Work! On April 28th, we celebrated the National Day of Prevention and Safety at Work, which is an homage to all the victims of occupational accidents and diseases and aims to raise awareness of the importance of adopting preventive measures to ensure safety at work and to prevent occupational accidents. We remind the entire FMUL community that the Faculty has a Committee for Health and Safety at Work (CSST) that, together with the Senior Safety Technician integrated in the Facilities, Equipment and Logistics Unit, seeks to promote a culture of awareness, education and prevention of occupational risks, promoting health and safety by following the recommendations from the relevant authorities and the legal regulations in force. No âmbito da Semana de Introdução e do início das atividades do novo Ano Letivo 2017 na FMUL, teve lugar, no passado dia 21 de Setembro, pelas 14:00, no Grande Auditório do Edifício Egas Moniz, a sessão Pela Nossa Segurança e Bem-estar, que teve como público-alvo os alunos do 1º Ano, que agora chegam à FMUL. 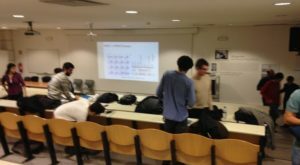 O painel de oradores foi composto pelos nossos colegas Isabel Aguiar, do Departamento de Gestão Administrativa, Carlos Encarnação, da Comissão para a Saúde e Segurança no Trabalho, Duarte Lopes, do Estádio Universitário de Lisboa, por Bruno Batista, da INERCO, e por Ana Ricardo, Agente da Polícia de Segurança Pública. O início da sessão esteve a cargo da colega Isabel Aguiar, que apresentou os oradores e chamando a atenção dos alunos para a importância dos esclarecimentos que se seguiriam para o bem-estar e segurança dos alunos no decurso das suas atividades quotidianas nesta casa, o que fez também o colega Carlos Encarnação, com algum enfoque nos objetivos da FMUL neste âmbito. Bruno Batista (Plano de Segurança da FMUL – INERCO), abordou em pormenor sobre as razões que justificam uma mudança de atitude e uma atenção que todos teremos de dedicar a estas questões, em prol da nossa segurança. 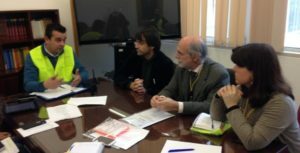 Apontou as possíveis situações de emergência e procedimentos a adotar, com várias referências ao folheto de Regras de Segurança distribuído pela FMUL. Ana Ricardo (Polícia de Proximidade, Comando Metropolitano de Lisboa), abordou temas relacionados com a segurança de pessoas e bens, nomeadamente burlas, furtos de oportunidade, incluindo todos aqueles que ocorrem no espaço da Universidade, furtos por carteirista, furtos em viaturas e furtos de velocípedes. Numa apresentação sempre animada e dinâmica, o nosso colega Duarte Lopes apresentou a estrutura e variadíssimas possibilidades que se oferecem, não apenas aos alunos, mas a toda a comunidade da ULisboa. A Comissão de Segurança e Saúde no Trabalho (CSST) da FMUL foi criada em 2015 e tem como principal objetivo sensibilizar, educar, informar e formar para que a Segurança, Saúde e Bem-Estar seja uma responsabilidade de todos e de cada um de nós. Contamos convosco e solicitamos a vossa colaboração. 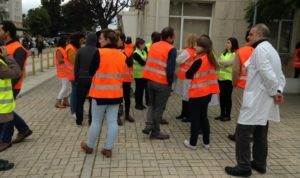 Given the importance of safety for all those who study, work and attend the FMUL, a fire drill was carried out at the Egas Moniz Building on 15 December, denoting the commitment of the emergency teams as well as the collaboration and understanding of all those who were in the building at the time. The link between the various teams – evacuation, intervention and 1st aid – that are part of the emergency structure. 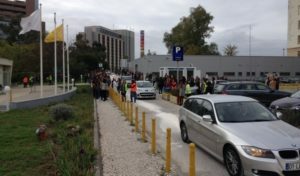 The fire drill took place during the building’s normal working period, with a fire in the office supplies area next to a teaching/research laboratory, triggering the actions to be carried out foreseen in the Internal Emergency Plan. Accordingly, the employees who detected the incident reported it to the Lobby by telephone and acted with the first line intervention resources available in the affected area. 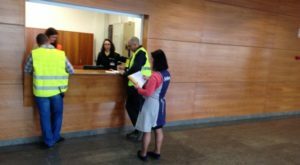 The Security Services assessed the progression of the incident, contacting the Security Delegates, who decided on the need for partial or total evacuation of the building, with the support of the Security Department. 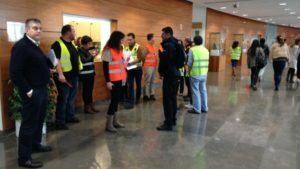 The emergency teams were activated and the procedures recommended for the type of situation in which the exercise took place were carried out. 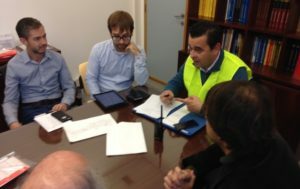 Control of key points to evaluate the results of the exercise, such as emergency area, emergency committee, meeting points, sensitive points, negative reactions by employees and visitors, effectiveness of the evacuation routes, and identification of possible accidents during the exercise. The contributions of the observers will feed into the Report that will be presented to the FMUL and which will be the engine for the improvements to be introduced. It should be noted that some of the participants in the fire drill, whether they belonged to the different teams or not, also gave their contributions regarding the aspects to be improved, giving us a non-technical but fundamental perspective for the improvement of safety behaviours. The exercise, as would be desirable, identified structural and behavioural aspects to be improved. At the time of writing this article, we await INERCO to submit the Technical Report. – Academic and Scientific Community as users of the building.